There is no ancient evil to defeat, no orphan destined for greatness, just two guys in the wrong place at the wrong time...Royce Melborn, a skilled thief, and his mercenary partner, Hadrian Blackwater make a profitable living carrying out dangerous assignments for conspiring nobles until they become the unwitting scapegoats in a plot to murder the king. Sentenced to death, they have only one way out…and so begins this epic tale of treachery and adventure, sword fighting and magic, myth and legend. Until I have started to blog my interactions with the small press publishers and discoveries of new authors through the independent sources of publishing were scarce and limited by my difficult accessibility to these titles. After I began to blog this situation changed and I enjoyed some wonderful books this way and that otherwise I could have missed. 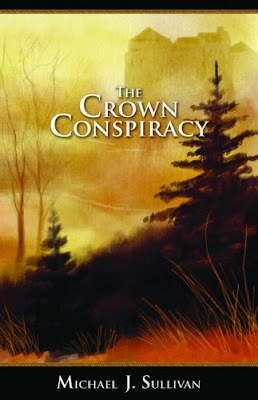 One such title is “The Crown Conspiracy” and I am more than happy that I could read Michael J. Sullivan’s novel. Michael J. Sullivan doesn’t waste time and throws the reader into action from the first pages of his novel and keeps him there until the final page is turned. I was hooked by the story and action from the beginning and with each page I turned and with each fold that uncovered the plot I was drifting away from our world into “The Crown Conspiracy” world. The novel is action packed and its rhythm doesn’t miss a bit and nothing interferes with the climax construction. There is a scene that has the feel of an action movie one, but in the general layout it fits well and didn’t raise my brow in disbelief. I really liked how the author built the mystery of his novel too and how he manages to keep it until the last possible moment. Michael J. Sullivan might not use many new elements for his fantasy novel and I could see some archetypes of the genre present in his story. But there is nothing wrong with how he uses them and how he turns them in a pleasant and captivating way. Such is the case with the main characters, Royce, a thief and Hadrian, a fighter, but they are far from being stereotypical. I grew fond of these two characters throughout the story and I believe that there is not a single moment when Royce or Hadrian sound false or have a misplaced dialogue. I also loved how they form a pair, with the links that connect two old friends and with the friendly teasing that results from such a relationship. And if the two main characters grow through the story and sound true so are the other ones. Each one sounds and acts accordingly to their status and situation and each one has his place in the story. Besides these interesting characters I enjoyed an interesting world as well. The kingdom of Melegar, where the action is taking place, and the planet of Elan are carefully built through the story, but without slowing the pace of the novel or interfering with the action. Michael J. Sullivan reveals parts of the world history, bits of geography, with some particularities of different regions, and last but not least some perspectives on the theological aspects of his world. Magic plays a minor role in the story and in the novel, but it is not neglected completely, with some scenes that add to the flavor on the world. “The Crown Conspiracy” is the first in a six novels series, “The Riyria Revelation”, but it can be enjoyed as an independent novel without problem. Michael J. Sullivan tells a captivating story in his debut novel and I am happy that I could read it and enjoy it. I am eagerly looking forward to see Michael J. Sullivan’s world and career developing further on. Thank you so much for a wonder review! So glad you liked it. Mihai, Sounds excellent are any others out in this series? I am intrigued to see how they will link as a sequence. Avempartha is due soon (April) in the US at least and it's even better, especially that I approached CC with no expectations, just the excerpt that induced me to read it, while for Avempartha I had very high expectations (met and even exceeded). This one is in a way the true series beginning insofar that it delves straight into the big picture and ends with a To Be Continued sign - though it solves its main thread so no cliffhanger. I might need to check this one out. This is the 3rd positive review I have read lately. On the basis of your review I am putting this book on my TBR list. Based on your good review I added the book to my list. I just wanted to say thanks to everyone who is adding it to their TBR lists. And of course thanks to Dark wolf, Liviu, and all the blogging community that has taken this book, and soon hopefully this series into their hearts. I agree with Liviu that book 2 is even better than book one and I think it does what few things do - which is gets better and better with each one. By the time you get to book 6 - I predict you will be 'blown away' - I know I was.